The 1995 hardback edition will be available at UNM libraries soon. This is the Norwegian hardback edition of Sacred Clowns, the eleventh Tony Hillerman Navajo Mystery novel featuring Joe Leaphorn and Jim Chee of the Navajo Tribal Police. This edition was published in 1995 by H. Aschehoug & Co. in Olso, Norway. 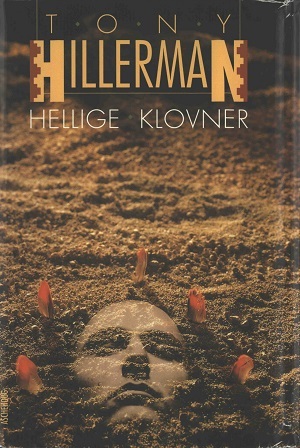 The text was translated into Norwegian by Atle Bjørge and the cover photo is by Espen Tollefsen. Format: Hardback, 21 x 13.5 cm. Binding: Red boards with the author's name and title printed in gold on a black background on the spine. The publisher's logo is also stamped into the spine.